Now I don’t know about you but I think that some where along the way people forgot the importance of saying “thank you”. And frankly, I think that is just awful! It’s simple to say and it can mean so much to someone. I think especially that when you have business, no matter how big or how small, it is important to always be grateful to your clients because without them you would not be able to do what ever it is that you love. 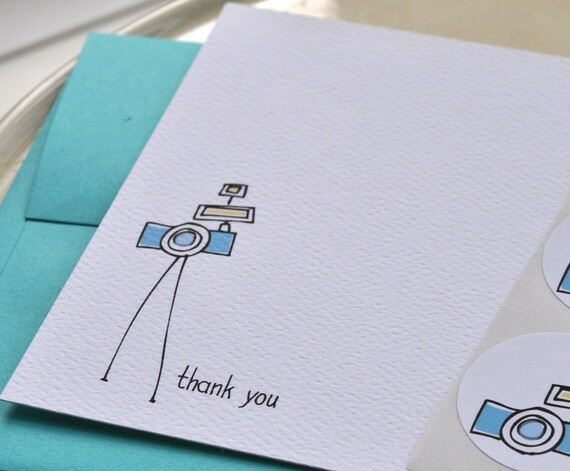 With all that being said…I found these fabulous thank you cards on Etsy! Created by EmilyAnnDesigns. I do not own a business, but since I love photography and I believe in saying “thank you” these cards are just what I was looking for! The image displayed is a post card style card. EmilyAnnDesigns also creates them in a folding card style as well.They printed on “velvet” high quality paper with UltraChome ink- I have no idea what that is but it’s definitely great quality! If this isn’t exactly what you are looking for send EmilyAnnDesigns a message because they love custom orders too! 12 of these babies (with stickers included) will cost you $16 and then an additional $2.50 for shipping. Totally worth it in my opinion. You can say thank you in style and leave a long-lasting positive impression on your clients.